From Kepler's pamphlet on snowflakes. Kepler's conjecture is that no packing of spheres of the same radius in three dimensions has a density greater than the face-centered (hexagonal) cubic packing. 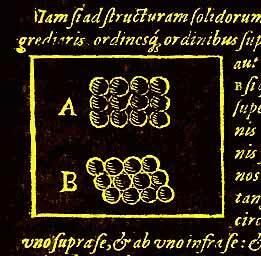 This claim was first published by Johannes Kepler in his monograph "The Six-Cornered Snowflake" (1611) – a treatise inspired by his correspondence with Thomas Harriot (see Cannonball Problem). In his slender essay, Kepler asserted that face-centered cubic packing – the kind greengrocers use to stack oranges – is "the tightest possible, so that in no other arrangement could more pellets be stuffed into the same container." The question of whether Kepler's conjecture is right or not has became known, not surprisingly, as Kepler's problem. In the nineteenth century, Carl Gauss proved that face-centered cubic packing is the densest arrangement in which the centers of the spheres form a regular lattice, but he left open the question of whether an irregular stacking of spheres might be still denser. In 1953, László Tóth reduced the Kepler conjecture to an enormous calculation that involved specific cases, and later suggested that computers might be helpful for solving the problem. This was the approach taken by Thomas Hales, a mathematician at the University of Michigan at Ann Arbor, and which led him, in 1998, to claim that he had proved Kepler was right all along. Hales proof of Kepler's conjecture remains controversial simply because of the length of the computer calculations involved and the difficulty of verifying them. The casebook on this mystery remains open.